Very high protection with a dry touch texture. To help protect against the harmful effects of the sun and protect the skin, Capital Soleil Dry Touch includes a wide spectrum filter system and photostable UVA-UVB based Mexoryl ®. Apply the sunscreen product just before exposure. Re-apply frequently and generously to maintain protection, especially after swimming, perspiring or towelling. 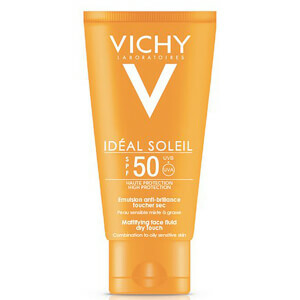 Use sunscreen products that offer sufficient protection for your skin. Avoid sun exposure at peak times. Avoid the eye area. In case of contact with eyes rinse them immediately and thoroughly.